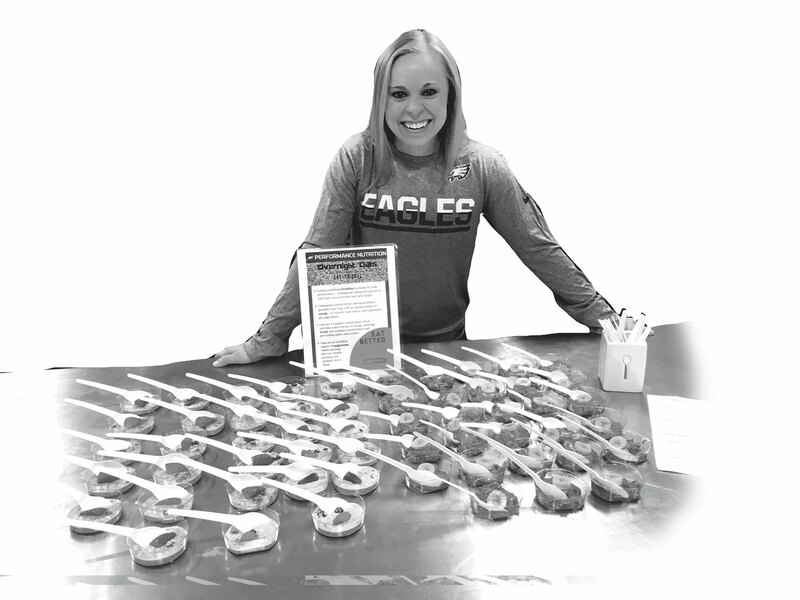 Working behind the scenes first at the Super Bowl for the Philadelphia Eagles and now for the University of Minnesota’s Golden Gophers, nutritionist Leslee Sholomskas ’16 teaches football players how to eat the perfect balance of calories to perform like champions. To be clear, there were no sweets involved. Hydration products, recovery shakes and protein-rich superfoods: yes. Sugary desserts: no. Sholomskas got her undergraduate degree in biology from Penn State, and thought she wanted to be a doctor. But while she was working at a cancer lab at the University of Pennsylvania, she started spending all her free time in the gym and online researching nutrition to ward off stress. Sholomskas landed the what-was-supposed-to-be-a-two-week internship with the Eagles in April 2017, but the team asked her to stay on through training camp. When the season started she became the franchise’s first-ever sports performance nutrition intern. She won’t divulge the specifics of her recovery shake recipes (Cowboys or Giants could be reading this article), but they were generally protein-based concoctions with additional supplements. Whatever she brewed, it worked. The Eagles, of course, tore through the NFL en route to the Super Bowl. When the team traveled to Minneapolis for the big game, Sholomskas went with them. Philadelphia’s Super Bowl headquarters were at the University of Minnesota, and the school’s director of sports nutrition, John Parenti II, took note of Sholomskas’ attention to detail and organization. “She just had the ‘it’ factor,” he says. So after the Super Bowl, he hired her to be an assistant director for the Golden Gophers. “Her demeanor, personality and vision of what she wanted to do, specifically for our football team and nutrition department, aligned with what we are trying to accomplish,” he says. But there was still one game remaining in her Eagles career. Sholomskas was on the sideline before the game, and she watched from the stands as the team won their first Super Bowl. It was a dream come true for a Philadelphia native and lifelong Eagles fan. So when the final whistle sounded and confetti fell from the rafters of U.S. Bank Stadium, did she allow the players to eat anything they wanted? “We had quite an after party, so I’ll say yes,” she laughs.